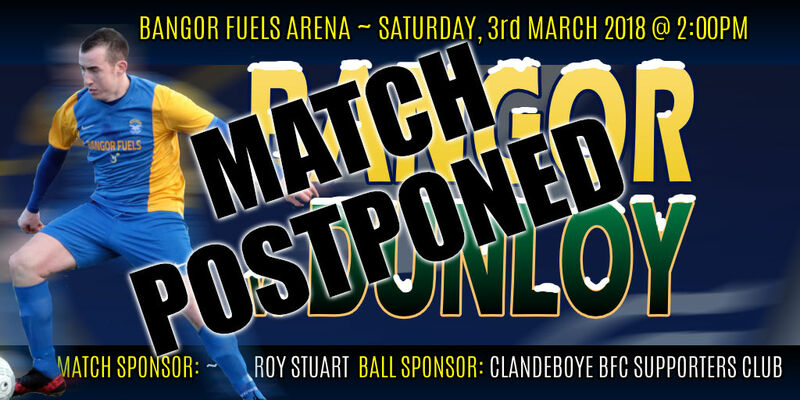 Bangor made it through to the semi-final stage of the Crawford Cup with a 3-0 win over Dunloy at the Bangor Fuels Arena this afternoon. On target for the Seasiders were Ben Roy(2) and Dale Patton. Bangor bounced back from the disappointment of last Saturday's defeat to Sofia Farmer with a convincing 5-1 victory over Chimney Corner at the Bangor Fuels Arena last night. Substitute Keith Armstrong opened the scoring after 11 minutes when he rose highest to head in a Mark Magennis free-kick. Bangor got their second goal two minutes later when a Gerard McMullan strike was controversionally judged to have crossed the line. A hopeful long ball from Brett Widdowson somehow found the back of the net in the 59th minute, before Corner pulled one back when Toner bundled in a rebound from a penalty kick. Ethan Boylan flicked in a Mark Magennis corner kick in the 66th minute for Bangor's fourth and Gerard McMullan completed the rout in the 75th minute when he converted a Ben Roy cross. MAN OF THE MATCH: BEN ROY - As chosen by our Match sponsors G&H Film and Television Services Ltd. and Alan Corbett. OTHER LEAGUE RESULTS: Dunloy 1-4 St.James Swifts; Sofia Farmer 1-2 Desertmartin; Coagh United 2-4 Glebe Rangers. 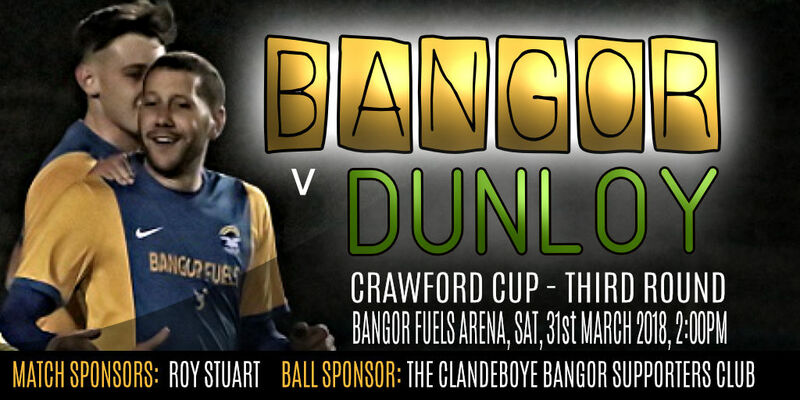 Bangor will be at home to Dunloy in the third round of the Crawford Cup on Saturday 31st March - (Kick-off 2:00pm). 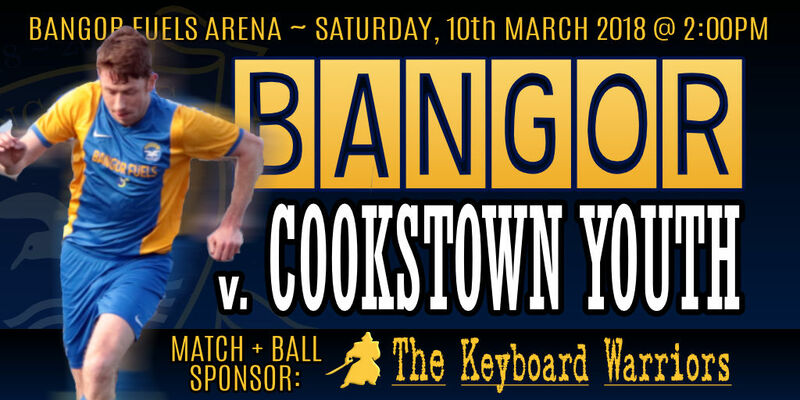 The following Saturday (7th), we travel to play Cookstown Youth in a League match. An ‘out of sorts’ Bangor side fell to their first defeat in over 4 months at a chilly Mill Meadow on Saturday afternoon. Luis Dias thundered a very creative Sofia Farmer side into a 16th minute lead with a shot from just outside the penalty area that flew past Gibbons. Slack defending from a corner in the 34th minute gifted Sofia with their second goal. 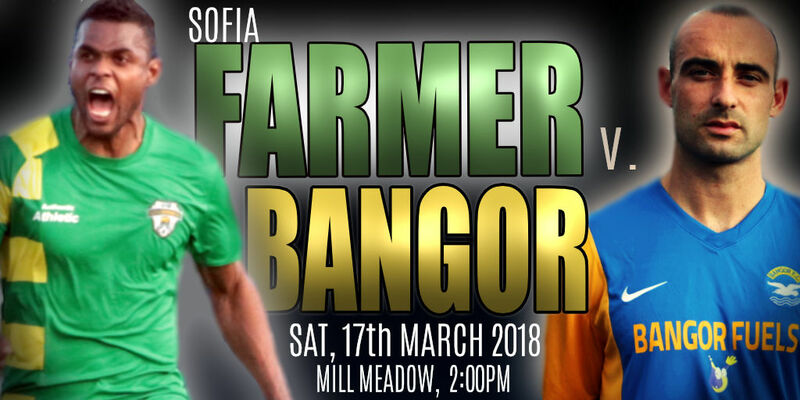 Bangor rallied and in the 40th minute Gerard McMullan blasted a shot in from the edge of the area to make it 2-1 to Sofia Farmer at half time. Bangor dominated much of the play after the break with Gerard McMullan and Ben Roy both going close for the Seasiders. Disaster struck in the 55th minute when the curiously numbered Rui Lanzinhas raced down the left flank and unleashed a shot that zeroed its way into the far corner of Gibbons' net to make it 3-1. Bangor rallied once again and a rare moment of quality passing saw Mark Cooling convert an easy chance from close range in the 70th minute. With the score at 3-2, Bangor pushed for an equaliser, but a combination of poor Bangor finishing and some last gasp Sofia Farmer defending in the closing stages ensured that there was no further scoring on the pitch. 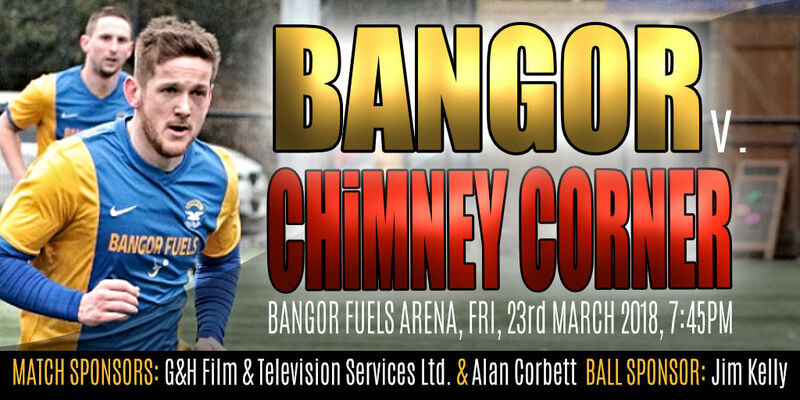 Bangor are back in action on Friday (23rd) evening when Chimney Corner visit the Bangor Fuels Arena for a league match. Match kick off 7:45pm. Bangor were made to work hard for their 4-3 victory over Cookstown Youth at a rain soaked Bangor Fuels Arena this afternoon. The Seasiders found themselves a goal down after 7 minutes when a moment of hesitation in the Bangor defence following a throw-in presented Malkie with an easy chance to score for Cookstown. Bangor captain Andy Long levelled it on 19 minutes when he rose highest to get on the end of Mark Cooling's cross from the right. Bangor's joy was short-lived - O'Neill's spectacular strike from the edge of the box 2 minutes later flew into the top corner of the net, giving Gibbons no chance. Things went from bad to worse in the 40th minute when more slack defending allowed Glasgow to unleash another pinpoint strike which once again gave Gibbons no chance and sent Cookstown into a 3-1 lead. Bangor fought back and just before the break, Mark Magennis was presented with a one-on-one chance against the keeper and made no mistake. The Seasiders trailed 3-2 at the break, but came out all guns blazing in the second-half. Ben Roy was quickest to react when the Cookstown keeper spilled a shot in the 47th minute - Roy's closerange effort went in off the upright. A couple of minutes later, Man of the Match, Mark Magennis spotted the Cookstown keeper off his line and floated a perfectly struck 40 yard shot over his head and into the net. The hard working Dale Patton and substitute Gerard McMullan both went close for the Seasiders in the second half, but there was no further scoring. In the end, Bangor were very relieved to hear the final whistle. Today's Man of the Match was selected by our Match and Ball Sponsors - The Keyboard Warriors. Coagh United 1-1 St. James Swifts; Cookstown RBL 8-0 Chimney Corner; Newtowne 3-1 Brantwood; Dunloy 4-0 Desertmartin.